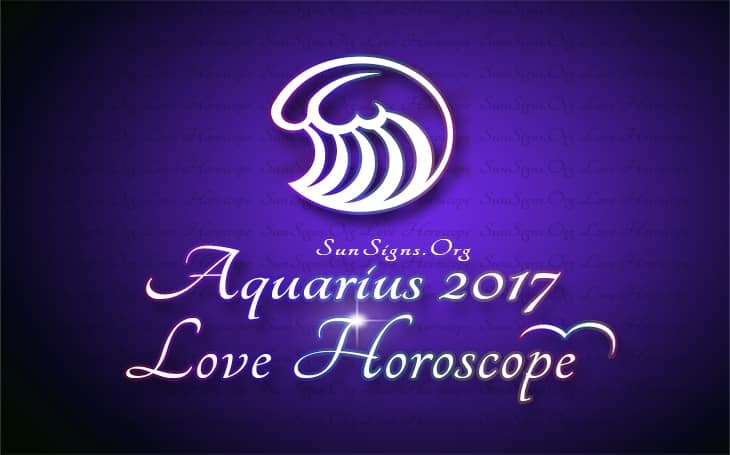 The Aquarius 2017 Love Horoscope predicts that the House of love and marriage is not very strong in 2017. Hence love and romance will give way to more social interactions. The status of married couples and single Aquarians will not undergo any alterations. Influence of planet Uranus will be felt in the love lives of the Aquarius zodiac sign and this might lead to turbulence. The 2017 love astrology predictions for the Aquarius star sign foretells that singles will enter into a series of love partnerships this year. There is no commitment in these relationships and they are more for fun. Be it flings or one night stands, you are tempted to try out everything. Commitment is the last thing on your mind. Between the months of April 2017 and August 2017, an old flame may come into your life again for some time. Proposals for marriage may come up in the month of August 2017, but nothing concrete happens. Planetary aspects are not favorable for long term love compatibility relationships in 2017 for the Aquarius man in love. The 2017 Aquarius love predictions forecast that you are looking for more liberty in your marital life and will like to explore the world extensively. There is an attempt to transform yourself comprehensively by changing your way of life. You will indulge in various activities to enhance your enjoyment. These may lead to severe conflicts in your love life with your spouse. Unless your spouse allows you your space and accepts your way of life, the marriage will be in danger for the water bearers. There is a possibility in 2017 that you will meet your ex-lover to clear some pending issues and this may lead to some misunderstanding with your spouse. This can be avoided if you take your present partner into confidence and your partner is willing to help. Marital life of parents will be stable and no major changes are envisaged. The 2017 yearly forecasts indicate that there is a possibility of spending a holiday with your soul mate in an exotic location. This will help you to resolve all the issues with your partner and bring more happiness in your married life. Even a pregnancy might be on the cards as the Aquarius in bed will be a wonderful sexual partner. If you are looking for a second or a third marriage, you are likely to date a senior person in your professional environment or in a social gathering. This person may be interested in getting entangled romantically with you. Marriage for an Aquarius personality in 2017 depends on whether that person will grant you the liberty you are craving for. The 2017 Aquarius love horoscope foretells that there will be significant alterations in the love life of children. Singles will get into marriage while the married may terminate their relationships in a breakup or divorce. If they are previously active socially, they will seek solitude. Children who are shunning social life will become friendly and engage in socializing with others frequently. Overall the Aquarius love horoscope for 2017 forecasts a year of obstacles and challenges when it comes to love and romantic entanglements. Respected Sir, I am Raviprakash from Gandhidham, Gujarat. you are kindly requested to predict my Career in 2017. Yous faithfully, Raviprakash.